Melene Thompson works with genes in Vibrio parahaemolyticus. One of the things that excited Melene Thompson most about going to Luther was an article in the Luther Alumni Magazine. It was a piece about Aimee (Villard) Boerger ’10 and Luther professor of biology Jodi Enos-Berlage determining divalent cation specificity of calcium-regulated genes in Vibrio parahaemolyticus. Only a true bacterium-lover can claim that particular excitement about a college—and Thompson qualifies. Of course, her interest is more nuanced than that. What she really loves is genetics, and, she says, “Bacteria are a great way to study genetics because they’re easy to work with, and their genetic codes are easier to manipulate than humans’. They’re also excellent candidates for genetic study," Thompson says, "because their generations are quick to turn over, taking anywhere from 20 minutes to a few hours. (They make human generations look downright glacial.)" If Thompson sounds casual about what most of us would consider pretty awesome mad-scientist powers, maybe it’s because she’s had a lot of exposure to manipulating genetic code. 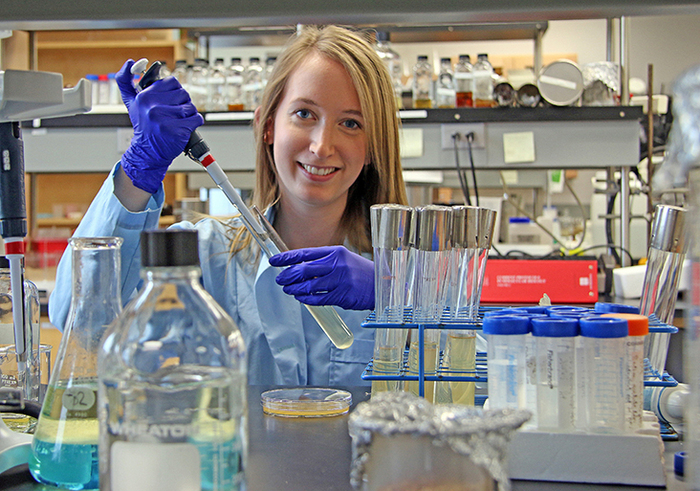 In addition to studying Salmonella during a summer research experience at the University of Georgia, Thompson spent a January Term at the University of Iowa studying Pseudomonas aeruginosa. In its acute form, the bacterium is generally not lethal but causes small infections. In cystic fibrosis patients, however, it’s often the cause of death because it creates biofilms in the lungs that block airflow. Thompson studied how the bacterium switches between these two types of disease in the hope of eventually controlling the mechanism that allows it to become the more lethal variety. And, like the Luther student in the magazine, Thompson also worked with Enos-Berlage on how concentrations of calcium and iron turn genes on and off in the Vibrio parahaemolyticus bacterium. Thompson and Enos-Berlage presented their research at the 2012 American Society for Microbiology in San Francisco. As if her lab experience weren’t enough to convince you that Thompson was born to research, take note that she comes from a pedigreed science family: her dad’s a geologist, her brother is studying geology, and her mom’s a chemist. Thompson will seal the deal when she enters the University of Indiana–Bloomington microbiology Ph.D. program in fall 2014.